History of Ice cream | Ice creams…………. 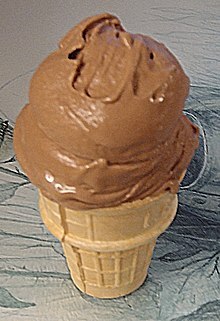 In the United States, ice cream cones were popularized in the first decade of the 20th century. On December 13, 1903, a New Yorkernamed Italo Marchiony received U.S. patent No. 746971 for a mold for making pastry cups to hold ice cream; he claimed that he has been selling ice cream in edible pastry holders since 1896. Contrary to popular belief,[attribution needed] his patent was not for a cone and he lost the lawsuits that he later filed against cone manufacturers for patent infringement. During the 1904 St. Louis Worlds Fair, The Banner Creamery’s owner George Bang was selling ice cream. Allegedly, he ran out of bowls and was given rolled-up waffles to serve it in instead. The earliest cones were rolled by hand, from hot and thin wafers, but in 1912, Frederick Bruckman, an inventor from Portland, Oregon, patented a machine for rolling ice cream cones. He sold his company to Nabisco in 1928, which is still producing ice cream cones as of 2012. Independent ice-cream providers such as Ben & Jerry’s make their own cones.